Wireless expert WDS is reporting that high failure rates in Android handsets are costing mobile network operators as much as $2 billion per year in dealing with repairs and returns. Reviewing the four leading mobile operating systems, its study found that Android-based devices seemed more prone to failure as 14% of technical support calls on Android were for hardware, versus 11% for Windows Phone, 7% for iOS and just 6% for BlackBerry OS. Simplistically, Android handsets were twice as likely to suffer a hardware fault that an Apple or RIM device. The study suggests that cheaper hardware, software customisations and OS updates all contribute to the failure rate and in turn, the increased impact on the network operators to provide technical support and customer service. WDS analysed over 600,000 technical support calls from July 2010 to August 2011. If you are thinking about buying or upgrading your smartphone, you might want to bear this research in mind before you purchase. The full WDS whitepaper can be downloaded from this page. ZDNet is reporting that Canonical is intending to make the next release of Ubuntu, 12.04, a LTS (Long Term Support) release with intention of then expanding Ubuntu beyond desktops and laptops into smartphones, tablets and smart TVs, with a target of 2014 for an all-platform release. Mark Shuttleworth, founder of Canonical, in an interview said, “This is a natural expansion of our idea as Ubuntu as Linux for human beings. As people have moved from desktop to new form factors for computing, it’s important for us to reach out to out community on these platforms. So, we’ll embrace the challenge of how to use Ubuntu on smartphones, tablets and smart-screens.” The full announcement is expected at the Ubuntu Developer Summit, which starts tomorrow and runs for a week in Orlando, Florida. While there’s no doubt that the mobile space is still maturing and there’s plenty of change still to come, I have a hard time seeing Ubuntu on anything but a small niche of tablets and an even smaller niche of smartphones. iOS and Android have their foothold and Microsoft will be a solid third if Windows Phone 7 continues to deliver and Windows 8 delivers as expected. A fourth player is going to have difficulty making inroads, especially one as relatively unknown as Canonical and Ubuntu. Smart TVs are a more plausible destination as the internal software is of less concern to the consumer. Most people buying a TV are looking at the exterior brand such as Sony, Samsung or LG, and not what’s inside, although this may change if a “Powered by Roku” or “Google TV inside” campaign runs. Plenty of change to come in this space too. I wish Ubuntu every success. A few days ago we received the sad news that HP was discontinuing webOS devices. The only good news out of that was for gadget lovers – HP has slashed prices on the recently released TouchPad (it’s already out-of-stock at Walmart online). The bad news for HP, beyond the bad press and bad stock prices, was that Microsoft leaped on the news and immediately began recruiting webOS developers for their Windows Phone platform. Microsoft’s Brandon Walsh reached out to webOS developers on Twitter, and began the process of bringing them over to Windows Phone. He even went so far as to offer free phones and other tools. At last check, he had received more than 200 replies. While HP has killed off the hardware-making side of their webOS business, they are hoping to keep the software alive by licensing it to third-party hardware makers, as Google does with Android. That means HP needs to keep these developers on board. That will be difficult with no agreements in place yet to ensure the OS’s future. Still, they are trying their best to maintain ties – see their blog post The Next Chapter for webOS. Given the current state, it will be hard for HP to hold onto these developers, and given what they have already done, it’s hard to imagine that they wouldn’t pull the plug on the software side of webOS at any moment. This has been a short ride for HP and webOS, and I can’t help but think that they didn’t give it it’s deserved time and effort. Consider it a premature death. Mobile data usage has been rising for quite some time now. But, with the release of the latest Nielsen report on cell phones, there’s some interesting data. The fastest rise is Windows Phone 7, which has shot up 89% since it’s launch. As of the November launch (4th Quarter 2010) data usage was at 149 MB, but now, as of the first quarter 2011 (March 2011), data usage has climbed from to 317 MB. While it is the fastest riser of this time period, WP7 still lags far behind iPhone and the industry-leading Android. iPhone has risen steadily to 492 MB, while Android has risen to 582 MB. 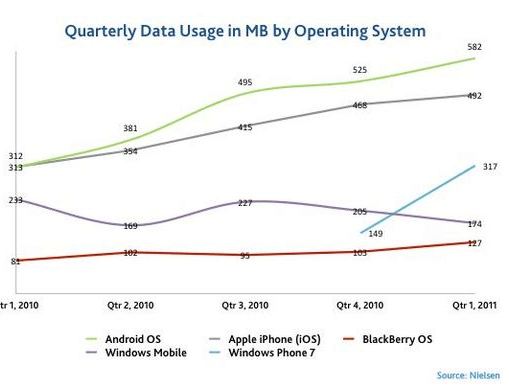 By contrast, RIM’s Blackberry OS has flat-lined and Windows Mobile, which is now on life support, has slowly trailed off. Web OS unfortunately did not garner a mention in the report. This seems to indicate that the field is narrowing to a 3 platform race between iOS, Android, and WP7. 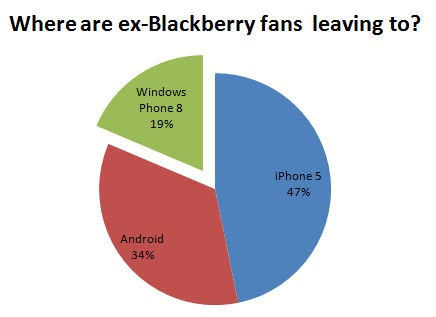 While Blackberry remains popular with corporate customers they are falling behind overall, despite their recent efforts. So what are all of you using, and why? What do you like and dislike about your mobile OS? Which mobile OS do you think will come out on top in the future? Give us your thoughts in the comments. Microsoft made some big announcements today at the E3 gaming show, most surrounding the Xbox, but a few involved Xbox Live in Windows Phone. However the bigger, or at least more interesting, Windows Phone news came from Microsoft Vice President of Windows Phone Joe Belfiore, via his Twitter account. Today an Apple fan got excited about the fact the volume up button can be used to take a picture. 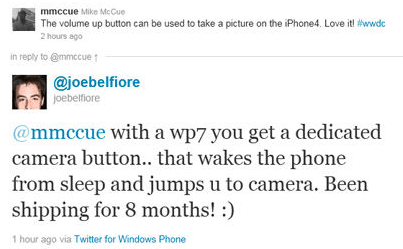 Mr. Belfiore responded, good-naturedly, that Windows Phone can do a good bit more. It was a rare bit of humor from Redmond, which tends to stick to the policy of ignoring Apple completely (while sometimes borrowing an idea). Perhaps the Windows Phone team has some reasons to be happy. After all, they are definitely on the rise, while Apple may be running a bit low on new ideas as they have slipped behind Android and are looking over their shoulder at Windows Phone. Today’s announcements didn’t break any new ground, but seemed more like playing catch-up. Make no mistake though, Apple can never be counted out and may have something huge brewing that hasn’t yet made it into the rumor mill. But, at least for one day, it seems Microsoft may have a leg up.